My daughter, Minna Blumenthal, received this beautiful and hopeful message online, and I want to thank her for sharing it with me. In turn, I am paying it forward to you all, and hope that you enjoy it's meaning, which is really quite profound and inspiring. She hated everyone, except her loving boyfriend. He was always there for her. Before you complain about the taste of your food - Think of someone who has nothing to eat. Before you complain about your husband or wife - Think of someone who's crying out to Almighty G-d for a companion. Today before you complain about life - Think of someone who died too young. Before you complain about your children - Think of someone who desires children but they're barren. Before whining about the distance you drive - Think of someone who walks the same distance with their feet. But before you think of pointing the finger or condemning another - Remember that not one of us is without sin and we all answer to one Maker. And when depressing thoughts seem to get you down - Put a smile on your face and thank G-d you're alive and still around. 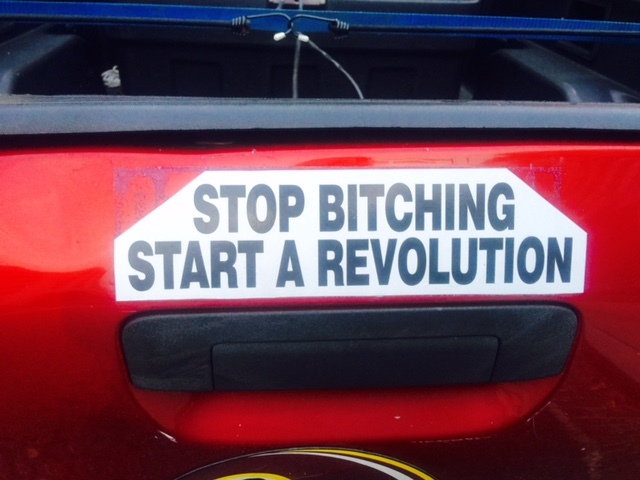 I took this photo of a bumper sticker on a pickup truck in Washington, D.C.
"Stop Bitching. Start A Revolution." So I'm thinking this is not the type of message you like to see in the capital of the country. 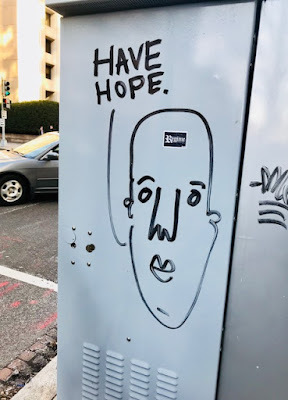 Perhaps what they do mean for people to do something more than just complain about the things they see that are wrong or broken, and instead to do something positive. Not a real revolution, but an evolution of change--incremental change, even baby steps, but leading to positive and constructive betterment! Stop just huffing and puffing about this and that. Consider speaking up, coming up with new and better ideas, advocating for something more, and actually helping to build it. Labels: Action, Advocacy, Betterment, Build, Change Management, Complain, Constructive, evolutionary change, Guillotine, Helping, Innovation, Leadership, Photo, Positive, Revolution, Speak Up, Tikkun Olam, Washington D.C.